Traveling with Your Golf Cart While on Vacation Is a Great Idea! Vacations can become more fun depending upon what you bring. It’s great to bring your friends. Sometimes it is better with your kids (sans the whole “Are we there yet?” thing and any teenage morose). Bringing your dog can be even fun, depending on the type of vacation you decide to take. Boogie boards and other beach toys can also certainly take the fun factor up a notch if you are taking a beach vacation. Here’s another great idea…bring your golf cart on vacation! You know how handy, practical and downright fun your golf cart can be at home. Imagine how great it would be on vacation. 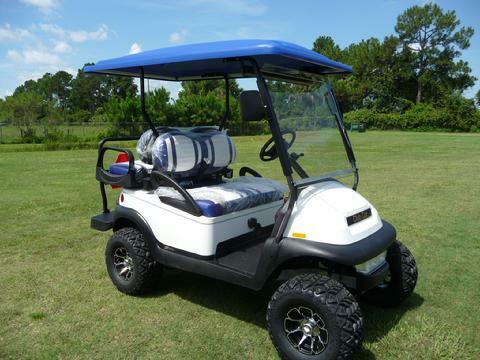 Golf carts are particularly convenient for a New Smyrna Beach vacation, because the weather here is always perfect for them, and they can be helpful in so many different ways here. You can load the kids (or adults for that matter!) up so they don’t get tired of walking when you are touring the town. You can take your golf car to the golf course or the beach. Load your golf cart up with a cooler full of treats and head to a riverside park for a family picnic. Golf carts are great to have when you vacation in a place like New Smyrna Beach – where everything is just an easy golf cart ride away! So pack up your favorite pillow and pack up your snazzy party pants, but don’t forget to pack up your golf cart. Zoom! Zoom!